Necklace, sterling silver and nylon-coated stainless steel, peridot green, 48-50 strand, 18 inches with lobster claw clasp. Sold individually. Item Number: H20-1476JE Have a question about this item? 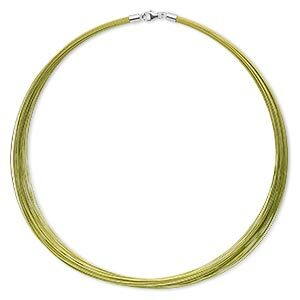 With 48-50 durable twisted stainless steel strands, this necklace is ready for you to adorn with a modern pendant. Suitable for holding heavy pendants. Necklace terminates with a sterling silver lobster claw clasp. Colors may vary. 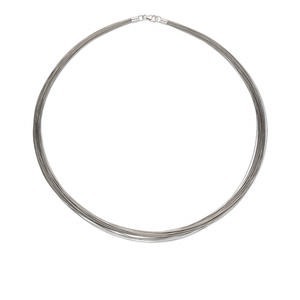 Necklace, sterling silver and nylon-coated stainless steel, silver, 48-50 strand, 18 inches with lobster claw clasp. Sold individually. 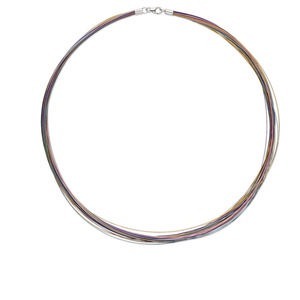 Necklace, sterling silver and nylon-coated stainless steel, multicolored, 48-50 strand, 18 inches with lobster claw clasp. Sold individually. 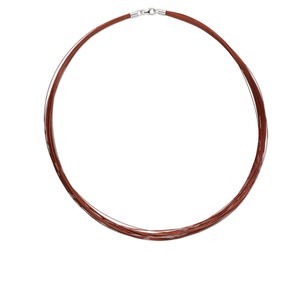 Necklace, sterling silver and nylon-coated stainless steel, copper, 48-50 strand, 18 inches with lobster claw clasp. Sold individually. 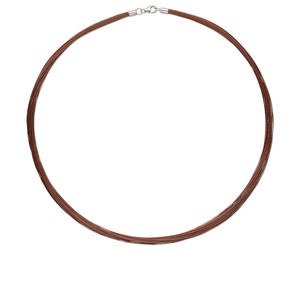 Necklace, sterling silver and nylon-coated stainless steel, brown, 48-50 strand, 18 inches with lobster claw clasp. Sold individually. Necklace, sterling silver and nylon-coated stainless steel, gold, 48-50 strand, 18 inches with lobster claw clasp. Sold individually. 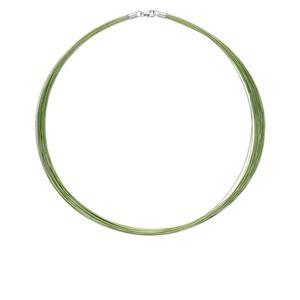 Necklace, 48-50 strand, nylon-coated stainless steel and imitation rhodium-plated sterling silver, peridot green, 16 inches with lobster claw clasp. Sold individually. 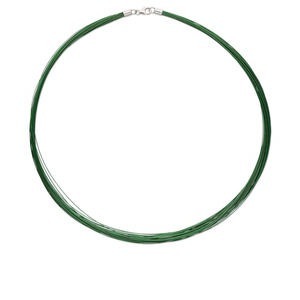 Necklace, sterling silver and nylon-coated stainless steel, emerald green, 48-50 strand, 18 inches with lobster claw clasp. Sold individually. 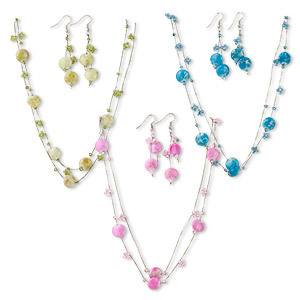 Necklace and earring set, acrylic / nylon / imitation rhodium-plated steel, turquoise blue / pink / green, 12mm flat round, 16 inches with 2-inch extender chain and lobster claw clasp, 2-1/2 inch earrings with fishhook ear wire. Sold per pkg of 3 sets. 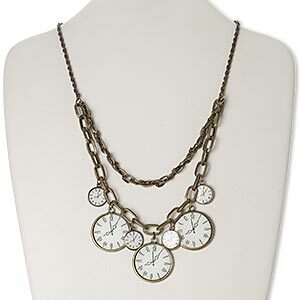 Necklace, acrylic with antique brass-finished "pewter" (zinc-based alloy) and steel, white / clear / grey, round clock, 18 inches with 3-inch extender chain and lobster claw clasp. Sold individually. 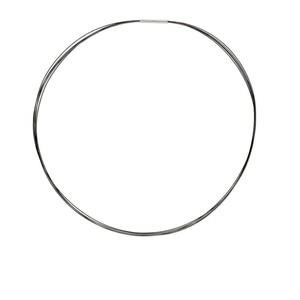 Necklace, plastic coated stainless steel, black, 5-strand choker-style, 18-inches. Sold individually.